I have some more very late posts to do. Life has been pretty hectic of late and because of that I have decided I need to make some drastic changes. SO, I have stepped down from all of my DT commitments except for CSI and I have taken a break from them too until August. I want to get to a place where my life is in balance again and I don't feel so out of control, I want to get to a place where I can love what I do again instead of it feeling like a chore. Change is hard but it is good. 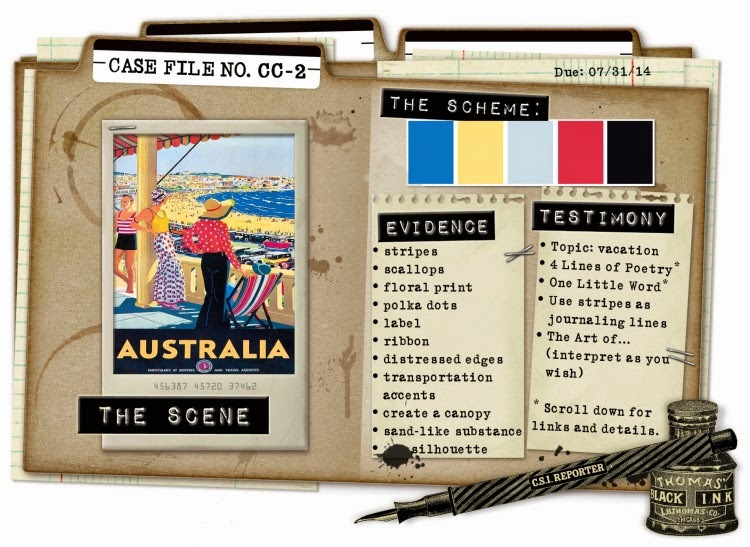 So here is the latest CSI/Artastic collaboration case file. I think if you haven't already checked them both out you really should. Here is the case file. Here is how I solved the case. Scheme - the colours are all there. Evidence - stripes, scallops, polkadots, ribbon, distressed edges. Testimony - The art of.... The quote on the layout says: The master in the art of living makes little distinction between his work and his play, his labour and his leisure, his mind and his body, his information and is recreations, his love and his religion. He hardly knows which is which. He simply pursues his vision of excellence at whatever he does, leaving others to decide if he is working or playing. To him he is doing both. James Mitchener. It was this quote that made me reassess my life at the moment. I decided after both of my kids left home to make their own lives that I was going to take time out for me. I have spent my whole life taking care of others putting everyone elses wants and needs before my own and I was tired and I just wanted to do what made me happy. Scrap! I have a beautiful room and lots of goodies to play with and I joined DT's because I thought it validated who I was, and life was good. Change is the only constant in life. Things never stay the same they are always changing whether we want them to or not. I realised that my family is always going to need me and they are always going to want me to make things better and actually a part of me needs that too. If you want to maintain friendships you have to work at them too they will not maintain themselves. Simon and I are at an age now where we can travel and have some fun and I love that. I realised that with the demands of DT's I had lost my love of scrapping and the pressure to come up with something new and exciting is not always that much fun when you are pumping them out. SO, change is here. 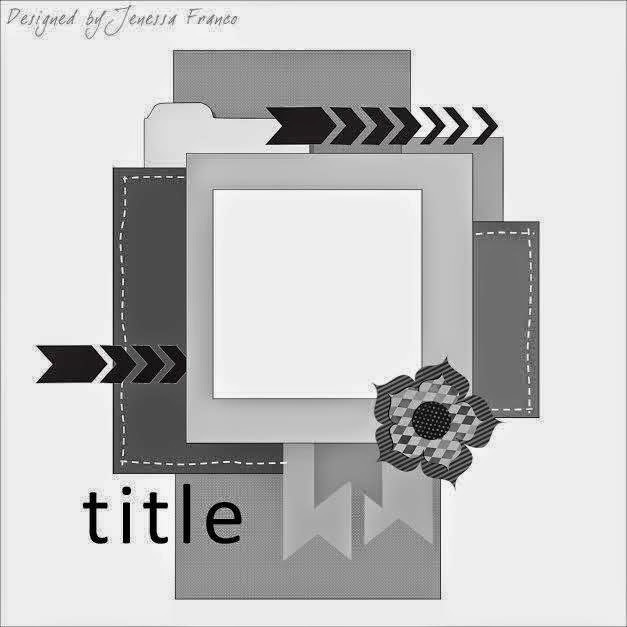 I have made some changes, some small and some big but all of them hopefully will help me get my life back onto an even keel, where I can travel, spend time with family and friends and still scrap because I want to record precious memories and NOT because I have to create pretty layouts. So here's to change. Here are some close ups. I used white cardstock for my background and added some blue and yellow watercolour. Once this was dry I added the blue and black splats. I added just a touch of red with that die cut doily and the bling. The polkadots is embossed onto the yellow cardstock. I also added some film strip. The title is made up from the prompt and the quote and I wrote the quote around the edge of the layout. I coloured the seam binding with distress stain and added a couple of hat pins to the bow. Thanks for stopping by to take a look and for taking the time to leave me a comment I want you to know that I really appreciate it. Life is full of seasons and changes, I hope these changes are good for you! Lovely layout, amazing photo and what a great sketch too! Take care and enjoy your day! A beautiful take on the sketch and case study. Love the journalling around the edges. Yup! Gotta get that balance...& you are soooo right - the only constant is change. Which I've never liked & it's taken me to my 50s to be OK with it. Just....!!!!! And I really LOOVE the 'assembly required' little stamp/quote here!!! And I can sooo relate to what you are saying....AND having the grand boy just that extra day each week has made me realise how much time it takes OUT of my week....not that I don't love him....but it makes me nod my head to what you're saying here. I hope this all creates not just a greater sense of balance, but a more fun, creative scrappy streak coming on!!!! Bravo Val! When something you adore and do for release of stress and for the peace it brings becomes a tool of anxiety, time to move on my friend :) I have seen a few of the "rock stars" in this field say they are pulled in so many directions how will they ever keep it up. Keeping a healthy balance can get rough. I hear ya on the being needed even when they've flown the coup :) And yes, it makes me happy to know that even the bigguns still crave their mama. A fabulous page, Val. That's a great photo. I love the watercolours on the background and the quote written around the border. Thanks for sharing it with us at ARTastic. I firmly believe we all need to enjoy whatever hobby we choose to have. When we find ourselves only doing it because we feel obliged to then it stops being enjoyable and something needs to give. This is a lovely heartfelt page, thank you so much for sharing with us on ARTastic. Hope you are able to find a balance in your life. I'm clapping and cheering and hearing you loud and clear Val.Good on you for assessing what you are doing so honestly. Your layout is lovely. I hope that you do get back your joy of making. Validation will be that you love what you are doing. Thank you for joining with ARTastic this month. 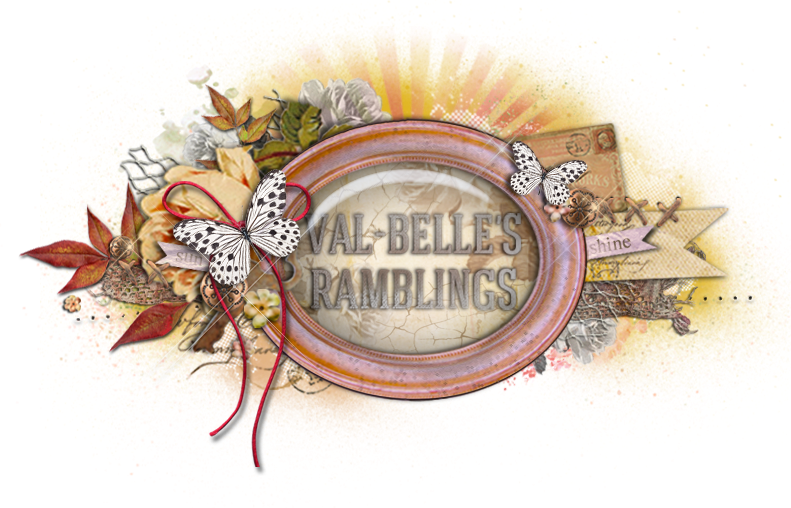 Back again Val to say how much I love the Disclaimer set from 7 Gypsies that you used...now these stamps make ME happy!